It's happens every year. After months of bicycle wheels and running shoes, white gold suddenly begins to appear in the sky, bringing with it that familiar anticipation of another season of heading for our local mountain playground to dance with gravity on snow covered slopes. But for most skiers something evil accompanies that wondrous anticipation; a dreadful creature named DOUBT! While the snow guns blaze a carpet of white in preparation for opening day the demon quietly lurks and torments in the shadows of our psyche. And as we sit on that chilly seat, riding the lift to our first run of the year the demon rises to the surface, and we anxiously think to ourselves, "sure I felt great at the end of last season, but will it come right back? Will I really remember how to do this?" Well, as experienced skiers know, the anxiety quickly fades as the first patch of mountain pass beneath our feet and we once again revel in the sensations that so tightly bind our love for the sport. Immediately we're once again the skiers we always knew ourselves to be! Yet the opening day ritual is not over. In the wake of our silly little annual panic, a higher sense of awareness begins to set in. While we've discovered we still possess the goods, upon closer inspection we notice that those goods seem a little dusty. Our balance is a tad off. The start of our turns a little rough. Our reactions a little slow. We need to freshen up. This article is designed with the intention of providing some hints on how to do that. While many skiers just try to struggle through the early season wobbles, with no clear plan on how to combat them, there are others who have learned a few secrets about how to quickly get back on top of their game. This article will provide you with some of those tried and true secrets. It will offer you some drills specially suited to getting you quickly reconnected with your technical awareness, and back on your feet. The drills you'll find here can be used your first days back on snow to quickly get the summer rust off and fine tune your balance and edge feel. They'll rapidly get your technical execution and awareness back mid season form. But they can go beyond that, too. They also have the potential to expand the skill foundation you currently possess, and take your skiing to even higher plateaus than where it presently resides. So give them a try and let them help set the tone for an enjoyable and successful season on the snow. The following drills provide a quick refresh on basic edge control skills. While side-slipping, gradually roll your skis on edge until engagement brings you to a stop, then gradually roll your skis back off edge until you begin side-slipping again. Continue to repeat this engage/release cycle. Stop, turn 180 degrees, and repeat the above drill. (Type A): While side-slipping with shoulders facing downhill, engage edges to a stop, plant pole, pivot 180 degrees, continue side-slipping and repeat. (Type B): Same as type A, except do not come to a stop prior to each pivot. (Type C): Side-slip with shoulders facing downhill, and uphill foot ahead of downhill foot. Without coming to a stop, pivot both feet in place so that each foot continues a straight down the falline path of travel. Repeat, repeat, repeat. On very flat terrain or a cat track, roll skis onto outside edges, allow skis to track apart, then before skis get too far apart roll skis to inside edges and allow them to track back together. Repeat. On flat terrain, while doing a straight run, flatten skis and allow them to rotate/spin 180 degrees so that you end up facing uphill. Straight run backwards for a shot period, then execute another 180 spin and continue skiing forward. Multiple repeats. Same as drill 4, except spin all the way around and then continue to straight run. Repeat in opposite direction. Also try doing multiple spins with no pause in between. 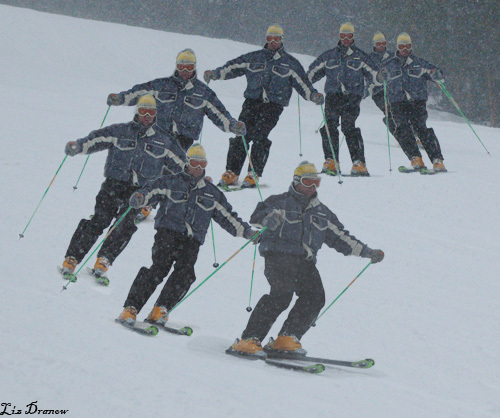 These drills get you comfortable with performing on various positions on your skis. They promote a keener sense of awareness of where your point of balance is at any particular moment while skiing, and develop your ability to adjust that point of balance when and as desired. On gentle terrain, ski with all the pressure on the balls of your feet, no pressure on your heels, and with slight shin pressure on the front of your boots. Make a variety of types and shapes of turns in this balance position. On gentle terrain, ski with all pressure on your heels, no pressure on the balls of your feet, and with slight calf pressure on the back of your boots. Make a variety of types and shapes of turns in this balance position. Same as drill one, except with an extreme forward position, and heavy shin pressure on the front of your boots. Feel the tips of the skis bending strongly, and the tails off the ground or at least very light. Same as drill 2, except with an extreme aft position, and heavy calf pressure on the back of the boots. Feel the tails bending strongly, and the tips off the ground or at least very light. Start your turns in a subtle forward balance position. When you get halfway through your turn, shift to an aft balance position. Same as drill 5, except exaggerate the amount of forward and aft. This one will feel strange, but it's a good versatility drill. Start your turn in an aft balance position. When you get halfway through your turn switch to a forward balance position. Same as drill 7, except exaggerate the amount of aft and forward. As you make turns, lift your inside tail for the duration of each turn. As you make turns, lift your inside tip for the duration of each turn. For the first half of your turns, lift your inside tail. For the second half of your turns put down your inside tail and lift your inside tip. Lift entire inside ski for the entirety of each turn. Same as drill 9, but lifting and replacing the outside ski. Lift outside ski for the entirety of the bottom half of each turn. Lift outside ski for the entirety of each turn. Alternate lifting and putting back down the inside foot and then the outside foot for the entirety of each turn. Through the entirety of each turn, continuously shuffle your feet forward and back. When outside foot goes forward, inside foot goes back, and vise-versa. Lift your inside ski until you reach the falline (skis pointing straight down the hill). When you reach the falline, put your inside ski back down and lift your outside ski. Keep that ski lifted until you arrive at the falline again in your next turn, and switch again. Keep repeating, always switching skis at the falline. The opposite of drill 20. Lift outside ski until you arrive at the falline, then switch to lifting the inside ski. Keep that ski lifted until you reach the falline of the next turn and switch again. This drill also goes by the names of "The White Pass lean" and "Weighted release". Make a series of turns with the tail of the same ski lifted at all times. Practice till proficient, then try with the opposite ski. Same as drill 22, except lift tip. With the same ski always lifted, begin each turn with only the tail lifted and finish each turn with only the tip lifted. The reverse of drill 24. Start turns with tip lifted, finish turns with tail lifted. Lift the same ski entirely off the snow and keep it lifted continuously for all your turns. These drills refine your ability to sense and create lower and upper body separation and angulation. With your hands held in a normal and comfortable position, hold your poles horizontally out in front of you. Make a series of turns in which your poles are always held level and are kept facing straight down the falline. To make a turn place your outside hand on your outside hip and very subtly and progressively push your hip toward the inside of the turn to build edge angle. At the same time hold your inside arm straight in front of you at shoulder level, pushing the inside hand and shoulder forward. Attempt to keep shoulders level. To finish your turn, return your inside hand to your inside hip, allowing your skis to roll off edge. Pause. Start a new turn by reversing the rolls of your hands. Hold poles as you did in drill 1, but keep them always pointing to the outside of your turn. Execute a little hop between turns and rotate your poles to the opposite side of your body while you're in the air. For those who can't execute the hop, simply substitute a aggressive shift of the poles from one side of your body to the other between your turns. Be sure when doing this drill the shoulders remain in directional harmony with the poles. Just shifting the hands back and forth is wrong. Well, there you go. You have enough drills here to quickly get your skiing back up to speed for the start of your season. If some of the drills I've presented seem beyond you present skill level, that's fine. Just do the one's you can, and the rest will provide you with valuable material to work on during the remainder of the season. All the new skills you develop from practicing these drills will serve the ever important goal of expanding your skill base and thereby catapulting your skiing to higher levels. Best wishes for a super season. More information on these drills will be provided in our up-coming Foundations series.